Here are samples of the notorious and very eccentric Florence Foster Jenkins that I mentioned Sunday morning. She truly was... in a world of her own. Proof that money and status will get you anywhere, including Carnegie Hall. 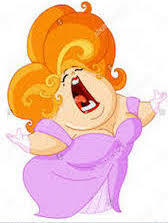 https://www.youtube.com/watch?v=DMu9PKWthLE (Adele's laughing song from Fledermaus, 4 min. Edith Bunker, you've been out-shined!